"I found this recipe and brought it to a Super Bowl® party to complement the variety of foods there. It is very versatile and goes with many meals." Place bacon in a large skillet and cook over medium heat, turning occasionally, until halfway cooked, about 5 minutes. Drain the bacon slices on paper towels; cut crosswise into 1/2-inch wide strips. Cut slits halfway through bread in two directions creating a checkerboard pattern. Slip Cheddar cheese slices and bacon pieces into the slits. Mix butter and ranch dressing mix together in a small bowl; pour over bread, allowing to drip into the slits. Wrap entire loaf in a sheet of aluminum foil and place on a baking sheet. Bake in the preheated oven for 15 minutes. 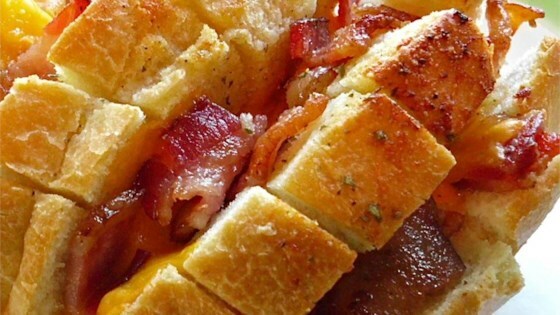 Unwrap bread and return to baking sheet; bake until cheese is melted and bacon is crisp, about 10 more minutes. This is a perfect appetizer for game day! May put broiler on when done if you like well-browned to further cook bacon and cheese. Keep in broiler for 1 to 2 minutes. Keep over door open as to not forget. It will be done fast! My family literally did not eat this, it was just a big greasy mess. Cutting the bread halfway down is not sufficient to be able to tear this apart. sound great but would like a picture to see how it is suppose to look.